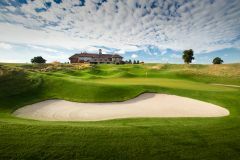 The Oxfordshire Golf Club is a fantastic championship layout designed by esteemed golf architect Rees Jones who is responsible for the creation of courses such as Torrey Pines and Bethpage Black so you can rest assured knowing you are in for a real treat here. The course is set in the heart of the Chiltern Hills and incorporates the natural landscapes, creating an exciting challenge for a whole range of golfing ability. Although the course is flanked by nothing but pure English countryside, The Oxfordshire is very accessible, located less than 30 minutes from Oxford and within an hour of London. The accommodation at the Oxfordshire is of outstanding quality, pure luxury throughout, guests will enjoy a number of first-class facilities such as The Tempus Spa, The Sakura Restaurant and even clay pigeon shooting. We found 5 offers matching your search. Signature hole: 17th hole, Par 5 - 588 yards from the white tees. A straight drive is required on this nerve-racking par-5, 17th hole to avoid the bunker on the right and the water to the left. The lake runs along the entire left edge of the fairway, with the green situated in the distance across the water. The safe but longer option is to play around the lake, while the longer hitters can have a crack at either a second fairway or the green itself in two. Jones vision for the Oxfordshire is a modern parkland course in from the American mould, and the incredible course in its short existence has already hosted the Anderson World Matchplay, the English Ladies Open and the Benson & Hedges International. Some of the professional game’s most prominent names have graced the course, which remains one of England’s best championship tests. From the tournament tees The Oxfordshire reaches 7,187 yards, which is more than enough for most golfing mortals, and throughout the layout are dotted some majestic holes. None is more famous than the 17th; this incredible par 5 has been named in Golf Magazine’s top 500 holes in the world, and is typical of the golfing adventure created by Jones. Along with The Grove, The Oxfordshire is at the forefront of modern English championship golf design, with terrific facilities that make it ideal for hosting high profile corporate golf events as well as being the ultimate stop on a golf tour around Oxford. The Oxfordshire Golf, Hotel and Spa is comprised of 50 luxurious and comfortable rooms which act as the perfect place to rest up before and after your round. There are two fantastic room options to choose from that both cater to your every need. Each of the 46 executive rooms come equipped with a whole host of modern amenities such as a TV, wifi, climate control and private balcony which allows you to enjoy the beauty of your surroundings from the comfort of your room. The hotel also 4 Penthouse Suites which are incredibly spacious with a separate lounge and bedroom area, 2 TVs, double furnishing in the bathroom and a large private balcony. The rooms are a fantastic place to stay in between rounds as the hotel rooms are just a chip and put away from all the essential facilities. Recently, the Sakura restaurant has been opened which offers guests the chance to enjoy delicious food in a truly superb setting. The restaurant is open for breakfast, lunch and dinner serving a number of signature dishes which are beautifully complimented by a number of wines and beers from the extensive drink list. Hotel room was very nice. The food in the restaurant was good however the service was very average. We waited at the restaurant door to be seated at least 10 minutes before the waiting stafff showed up. Nice and enjoyable stay at The Oxfordshire,was told the pool and spa was closed for refurbishing but was pleasantly surprised to find it open upon arrival. Had a private room for dinner and got to say food was exceptional. We booked this venue on the recommendation of Your Golf Travel some 2 months ago and it was only week a prior to going that I looked up reviews on Trip Advisor. I was slightly concerned after reading some of the reviews. However from the moment we arrived, things could not have gone better. The 2 receptionists (Angie and Anne) were an absolute delight, both were extremely cheerful and so willing to help and advise. Nothing was too much trouble. Because some the reviews were about slow play on the golf course (rounds lasting up to 5 ½ hours) we asked for our original table booking for the evening to put back an hour due to our concern of having to rush to shower and change for dinner. Angie said no trouble and sorted it out on the spot. We arrived at about 12.00 noon and as our rooms were not available we went to the spike bar to have a drink and a snack before playing golf at 13.40 pm. Again we received excellent service from friendly staff members. Some reviews claim the drinks were expensive, and while they are not cheap, they compare with the average hotel prices. The golf course overall was in excellent condition considering the extremely heavy rain that had fallen 2 days previously. Unfortunately some of the bunkers still had water laying in them but that;s understandable. The fairways and greens were in absolutely perfect condition and the course features a good selection of testing holes. A typical American style layout with plenty of water and lots and lots of bunkers; I would suggest a few too many. There was quite a lot of walking from greens to tees which might add to the time to play, but our 4 ball still managed to complete our round in 4 hours 30 mins. My wife was wearing a fitsbits which recorded the distance walked on this round and it recorded 7.32 miles. We did have a few waits on some the holes due groups in front. On our second round the following morning we manage a 4 hour 20min. Overall considering it was a new course to us the time to play seemed very reasonable. We booked a table in the main restaurant where we had a restricted menu included in our package, but for an extra £7.50 per person we could have full ala carte choice. This is something that we took advantage of and recommend to others. We were served by a delightful young lady by the name of Macarena and she was most helpful and very attentive. The selection on the main menu was extremely varied and we really enjoyed our choices. I did have a slight hic-cup in that my medium rare rib eye steak when served was cold, but as soon as I raised the issue the manager quickly responded by replacing with a freshly cooked medium rare rib eye, and apologised and additionally deducted our £7.50 surcharges from our bill. Top service. There was good selection of wine from which we selected both white and red wine and both were very good. What with the excellent service from Macarena and the prompt attention from Florin, plus of course the great food and wine; our dinner perfectly ended a truly enjoyable day. Overall our stay at The Oxfordshire really was a most enjoyable experience and one that we will definitely remember, as well as recommend to all of our golfing friends. The golf course at The Oxfordshire was in very good condition, with generous width fairways all with a good covering of grass and it’s an easy enough course to walk too. The greens held the ball and were a very good pace to put on, with the ball rolling out nicely. The hotel and clubhouse were friendly with efficient staff who knew what they were doing and always asked if all was ok. The price of the drinks was not too bad and typical of hotel prices. There was a good selection of wines available that covered all price ranges. The one thing that was not good was the limited choice of the food available on the set menu, with only two starters, two main course and two deserts. On the plus side what was supplied to eat however was very good. My overall verdict is 8 out of 10. The response to my enquiry for price and availability for this trip from Yourgolftravel was exceptional. All was done within an hour from our first call to the actual booking confirmation being sent through. I could not have asked for more. We had a great weekend staying at The Oxfordshire. The weather was amazing and the accommodation and service at the hotel could not have been better. Everyone loved the course at The Oxfordshire too. It was in immaculate condition and a real test of golf. Many thanks go to YGT once again for organising a fantastic golf break at such short notice; it was a birthday treat that was a dream from start to finish. The hotel is peaceful, clean and serves excellent food. The members of staff, particularly in the restaurant, really look after each guest and there’s a very good choice of food for dinner and breakfast. The guestrooms are spacious and comfy, and each room has its own balcony, which as a smoker is superb. The golf though is something else. There are bunkers and dunes everywhere, as well as huge lakes, so you really must apply course management and not be tempted to "go for" too many shots. The views are stunning while you play too. No matter your score at the end of the round, the experience of the course is a dream and we’ll definitely be returning soon. Thank you for recommending The Oxfordshire as it was everything we wanted from a golf break and more. This is a first class venue with a superb golf course, an excellent hotel and attentive and friendly staff and we will definitely return! If I was to make any suggestion to the hotel to improve the package it would be to provide a slightly broader range of dinner options. I don’t think offering 3 to 4 options would overly complicate things. Saying that; the food itself was excellent. it was very tough day high winds but all and all we enjoyed it , day two was a diferent story it poured with rain we didnt end up going out as conditions were so bad and course wes already very wet when we played it the day before , would return hopping for better weather . We were a two ball and on day one, there was two ladies four balls in front of us and the round took four and a half hrs. 2nd day was better. Q - Are there any weekend golfing restrictions?